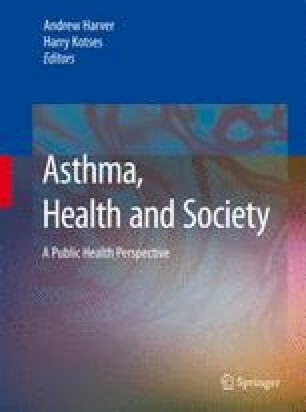 The workplace is, apart from smoking, a clearly identified cause for the development of chronic obstructive lung diseases, including asthma (Trupin et al. 2003). Many asthmatic subjects complain that their symptoms are worse at work as related to exposure to their workplace physical and psychological environmental stimuli. Epidemiological studies in the general population show that from 5% to one-third of all asthmatic subjects answer “yes” to the question: “Are your asthmatic symptoms worse at work?” (Blanc and Toren 1999; Johnson et al. 2000). Asthma in the workplace (AWP) encompasses several entities (Fig. 18.1) (Vandenplas and Malo 2003; Bernstein et al. 2006). First, some workplaces can cause asthma, mostly in subjects who, before starting to work, reported no respiratory symptoms. This condition is labelled “occupational asthma” (OA). Two causal mechanisms are implicated. Workers may develop an “allergy” to a product present at work or develop asthmatic symptoms after accidental inhalation of a product generated at abnormally high concentrations. Second, asthmatic subjects may report that their symptoms are aggravated or exacerbated at work although the workplace is not the cause of asthma. Third, several variants of asthma related to the workplace have been described. For instance, some workers in aluminium potrooms develop symptoms that share features of symptoms experienced by asthmatic subjects. Also, a condition that is called occupational eosinophilic bronchitis reproduces the pathologic but not the lung function features of OA.